Below is a stage by stage Architectural Services guide to a project. However every project is bespoke; with the services provided to specifically suite your project. 1. Initial Consultation (free of charge) Contact us to book. RPC Design arranges a meeting at your home, site or in our office to discuss your ideas & gather a brief for your project. Following this meeting we provide you with a no obligation fixed price quotation. If the project is alterations, an extension to your home or existing building; we will carry out a detailed measured survey of the property and produce CAD digital drawings of the existing structure. If the project is for a New Building we will arrange survey of the plot of land. We will produce sketch drawings of different design options and meet with you to discuss your project further. Some projects we will submit a Pre-planning Enquiry to discuss the project with planners further; before a formal planning application is submitted. We produce 2D digital drawings and 3D images of the final design for your approval. RPC Design will produce detailed construction drawings; ('the science behind the project') & submit an application to your local building control authority. These drawings will be for your builder or contractor to work from once approved. At this stage we will liaise with other professionals such as structural engineers & energy assessors. 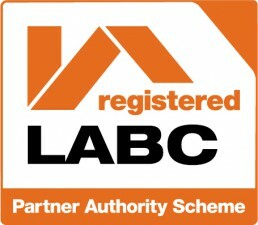 We can offer tender documents on your behalf to a number of trusted builders & contractors for your job to be priced. We will ensure the job is priced by each contractor 'like for like' for a good comparison. On some larger projects we will consult a Quantity Surveyor. Once construction work is started on site, we can make periodic site visits to ensure the smooth running of the project, and the project is built in accordance with the plans.